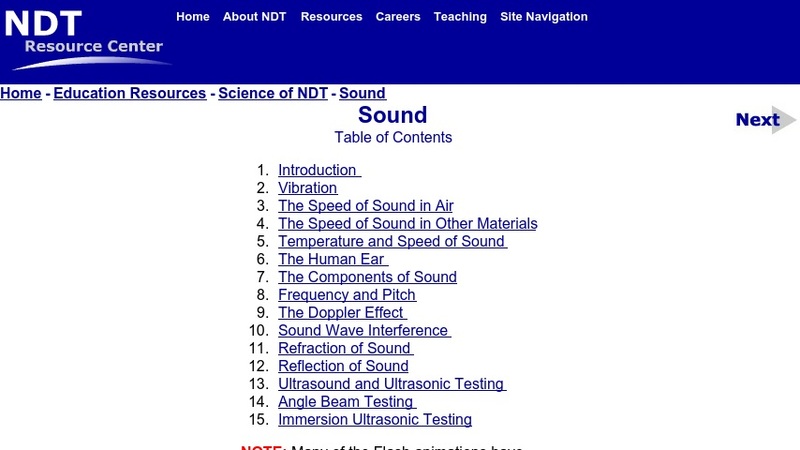 This is an interactive tutorial on the topic of sound, designed for secondary science learners. It is organized into sequenced headings that contain animations and guided review questions. It begins with an overview of vibration and properties of sound, then expands into the human ear, pitch/frequency, the Doppler Effect, constructive and destructive interference, and ultrasound. The use of diagrams and simple Flash animations alongside the text could make this resource especially appropriate for struggling learners and students with disabilities who need additional support. This resource is part of a collection developed by the Non-Destructive Testing Resource Center at Iowa State University.